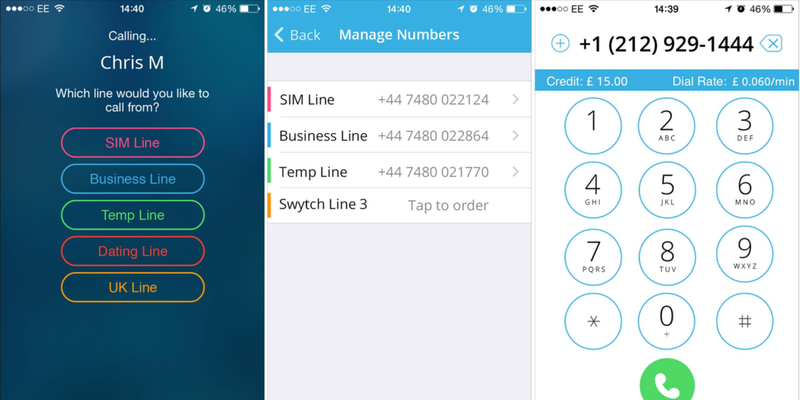 If the idea of merging your work and personal contacts fills you with horror, but a dual-SIM phone doesn’t fulfil your needs, then Swytch’s app for iOS and Android devices could be right up your street. In essence, all you need to do is download the app and register a new number, which qualifies you for 50 pence of calling credit. Making calls on your new virtual number costs 6 pence per minute to a UK number (or per SMS), but calls between two Swytch users are always free – a bit like Skype. “Swytch does for mobile numbers what Dropbox has done for files; it detaches the numbers from the SIM card and hosts them in the cloud. This means users can login to their Swytch account from any internet connected device and communicate from any of their Swytch numbers,” the company said. Your number only remains free for six months, though. After that it will cost you £4.99 per month, £14.99 for six months or £24.99 for a year. The service will allow up to five numbers on a single device. While it’s a useful way for a non-UK based company to keep in touch with UK customers, or expats to keep in touch with family, it could come in just as handy for people living in the UK who don’t want to give out their primary phone number to services that often result in spam, like online dating or recruitment. It’s a similar idea to Burner and not all that different from Shuffle’s target market. And of course, there’s also similarities in some use cases with services like Skype or WhatsApp, so Swytch will need to continue to fine-tune its pricing and feature offering if it wants to keep users interested.